Understanding the complexities of audio is more often than not the barrier to good sound and the solution to which Sennheiser was looking for when developing their new AVX system. The AVX is a wireless microphone system designed for totally stress free audio capture allowing everyone (in Sennheisers words) to "relax". Launched at NAB and having its European debut in Cannes, just ahead of the film festival, we were invited to get our hands on it and find out more. Sennheiser undertook significant research involving panels covering all market sectors as well as working in collaboration with filmmakers such as Geert Verdickt to come up with the "Oracle" of audio performance and simplicity. Crucial during development, Geert, a video journalist and self-confessed one man band, explained how he worked; "When shooting there are three main things I look for. (1) Form: The size of the kit is important, trailing wires and cumbersome receivers are not good for anyone. (2) Emotions: these are what separate video and audio. You see a film of a lady crying with no audio and it has little effect. Add the audio and suddenly you have millions of YouTube views. Finally (3) Authorship: this is how you tell the story, how you make it your own. Combining these three gives you something that will make good tv". Geert is also an educator running workshops on filmmaking and it is clear that Sennheiser have listened to what is needed and the result is the amazingly compact AVX receiver which plugs directly into the XLR socket of a camera. From here it automatically pairs with the microphone and, using phantom power control from the camera, switches on when the camera does. It is not however phantom powered but uses lithium ion rechargeable batteries offering around 4.5 hours of constant use. Bearing in mind that it is turning itself on and off with the camera then that could be many hours of shooting depending on your job. The system automatically adjusts the correct audio levels and transmits using a specially protected link in the license-free 1.9 GHz range which requires no registration and is in use across many countries worldwide. Depending on your geographic location in the world up to 12 units can operate in the same area automatically and inaudibly adjusting frequency on the fly without the need for any operator adjustment, or even knowledge that the frequency has changed. The whole point behind AVX is that the user doesn't need to worry or care about frequencies, just plug in and press record. 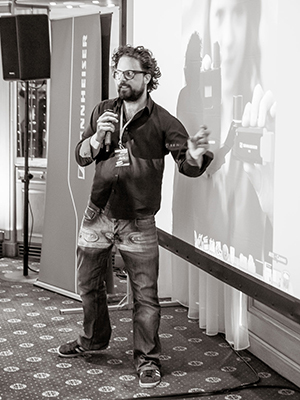 "Whether you're a journalist compiling a show report, a professional videographer filming a documentary or an in-house marketing specialist making a product video - AVX gives you the room to concentrate on your creative work", says Sven Boetcher, Portfolio Manager Broadcast & Media at Sennheiser. "No licensing is required, the system automatically selects a suitable transmission frequency and also makes all necessary settings - that's true ease of use." Sennheiser have created several ready-to-use AVX systems that contain everything required to immediately go live with varying contents depending on the desire for an interview or clip-on mic. They also understand the wide ranging use that this system will attract and include an XLR-3/mini-jack adapter cable for DSLRs plus the mounting accessories needed to attach the receiver to the camera hotshoe, recognising that this camera format is often used by people exploring beyond the stills photo world who want quality audio with ease of use. 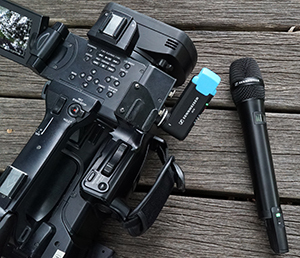 AVX is equipped with adaptive transmitting power, meaning that the system always uses the power that is required to maintain a reliable connection between the microphone and the camera receiver. This ensures a stable link and also reduces battery power consumption - as does the automatic on/off function. Not only is the receiver powered by special lithium-ion batteries but so is the transmitter. For continuous recording you can power the receiver with a USB source such as a mobile phone style battery backup pack. For peace of mind battery levels are shown on the transmitter to avoid nasty surprises! Time will of course tell but from first hand use around the mega yachts of Cannes the system performed without fault and we found ourselves forgetting about the audio and concentrating on our rather amateur production we'd be tasked to create. Not worrying about audio is exactly what Sennheiser want content creators to do and although headphone monitoring is essential no matter what system you choose the AVX will, from our experience, take the possible complexities of audio away from you. Finding the Oracle of audio capture is no mean feat but Sennheiser's AVX may not be far away so, as they say, just relax.